One of the camp activities is designing T-shirts. BASSETERRE. 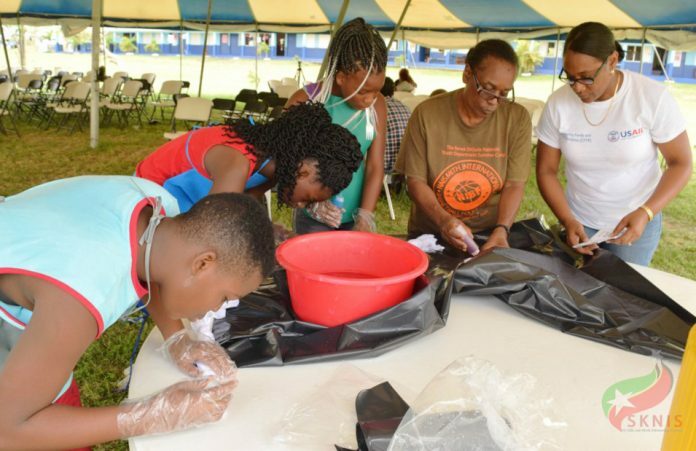 St. Kitts — More than 100 youth are developing their social skills, making new friends and exploring their talents in a variety of fields at the 35th Annual Summer Residential Camp being staged at the Beach Allen Primary School. The theme for this year’s event is “Preserving Our Land of Beauty.” Activities are being held that incorporate action in this regard. “The topics related to this theme are water conservation; turtle-monitoring and protection; waste disposal and recycling; and tourism and the environment,” said Senior Youth Officer, Diane Dunrod-Francis, “The waste disposal segment already took place and featured representatives from the Solid Waste Management Corporation. The camp, hosted by the Department of Youth Empowerment, saw several changes this year. The first week was held primarily for dorm leaders, who spent July 15 to 21 in leadership training sessions facilitated by Community, Family and Youth Resilient Project officials. Part of the weekend was used to finalise the arrangements for eight-to-16 year old children, who were welcomed July 22. On Monday, July 23, Permanent Secretary in the Ministry of Youth, Sports and Culture, Stanley Knight, greeted the campers and assured them of the ministry’s commitment to provide positive and wholesome activities to enhance their empowerment. During a Wednesday, July 25 visit to the camp, Mrs. Dunrod-Francis, said all was going well. The campers were deeply engaged in a variety of disciplines including T-shirt design, traditional drumming, marching band, fruit bowl design, airbrush, film-making, and dance. On Thursday, the campers, dorm leaders, and staff, performed another activity to care for the environment. “[We will] just go and clean up the beach, get involved in the communities, and make sure that they (the public) know what it’s all about in reference to the theme that we have for our summer camp this year,” the senior youth officer said. Fun activities are all a part of the camp experience, and Thursday there was a talent show and sports day. Today there is a barbeque and on Saturday there will be a banquet. The children depart on Sunday, July 29.